This Warrior weapon with the interesting name damages your minions after you play them. The reveal was made by Card na Manga. The video is in Portuguese with English subtitiles and it is one of the best reveal videos so far! Blood Razor rotates out of Standard in half a year and perhaps this card was printed as some sort of replacement. The comparison is void, though, because the Whip is nowhere as good. Sure, Warrior has multiple minions that could benefit from some... whipping but at the same time there's a reason why Animated Berserker never saw any play. Even though it would be a perfect opportunity for Enrage to make a comeback in this Troll expansion, it seems that the emphasis this time is going to be given to the new Overkill keyword. 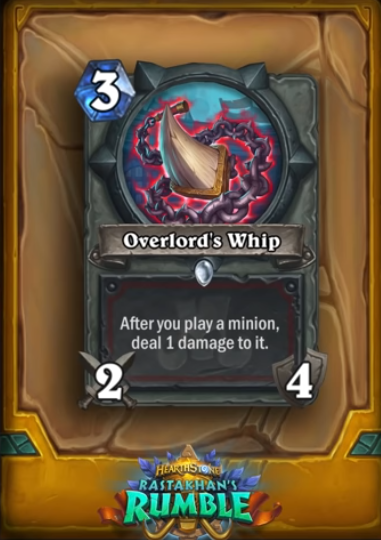 A 3mana 2/4 weapon on curve is pretty good (ridiculously good with Upgrade in a no weapon removal meta), but generally you’d need the help of some small minions to make the 2 attack stay good after the first hit or two. So damaging any you play isn’t ideal. Unless you really want to damage your minions I struggle to see this being played. Wouldn't this be nice with Grim Patrons? Not really, since it only damages minions you play. So you can only play a Patron from your hand, weapon damages it, second Patron is spawned from the first, end of story. There are better and cheaper ways to produce way more Patrons. If it damaged all summoned minions, it would be absolutely busted. What I meant is, with this weapon, you automatically summon 2, then you can summon them with other cheap spells. So, if you already have this; Patron, Inner Rage, Whirlwind is 6 patrons instead of 4 w/o the weapon.